Dogs in the Workplace Increase Productivity! 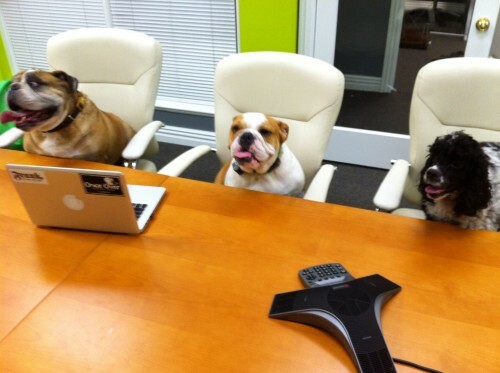 Wouldn’t it be great if your office had a policy that allows you to bring your dogs to work? A lot of companies have offered just that option as dogs have become such an integral part of our lives. Dog owners love it because it takes the stress off of leaving your dog at home or at doggy day care. In fact, there has been a lot of research that suggests a dog-friendly office has a real impact on employee well-being and productivity! Tell that to your boss! The most famous study conducted on dogs in the workplace found many benefits for dogs and owners! In one of the most famous study on dogs in the workplace, researchers at the Virginia Commonwealth University Center for Human-Animal Interaction found that having dogs around the office produced a wide array of benefits for both pet owners and their pet-less co-workers. The study found that productivity increased even in employees who don’t have dogs! The study, which was published in a 2012 edition of International Journal of Workplace Health Management, look at Replacements Ltd., a manufacturing services company in Greensboro, N.C., where several dozen dogs are allowed at the office. The study found that employees who brought their dogs to work experienced significantly lower stress levels AND that a sizable portion of pet-free co-workers viewed the dogs’ presence increased their productivity too! The VCU study also supports the idea that dogs could help inspire buzz-wordy concepts such as collaboration and cooperation. When there were dogs at the office, people who normally wouldn’t talk to each other did and that all of a sudden there was a connection and a feeling that they were part of a team. Randolph Barker, Ph.D., a professor of management at the VCU School of Business and one of the study’s authors said that the dogs were like a social lubricant. Exposure to dogs could also increase the release of the hormone oxytocin, new research suggests. Although oxytocin is best known for its role in human and animal bonding, it has a wide range of effects related to overall health, sociability, trust, and how we generally get along. Because so much work depends on team dynamics and interactions in the workplace, these effects can be critical for well-being and productivity. Of course, an office in which our dogs run amok would also be extremely unproductive. Barker says firms need to manager pets’ presence effectively. That means talking to employees before dogs are introduced into the office and accommodating those who may have allergies or phobias. Allowing employees to bring their pets to work could also serve as a low-cost wellness intervention or an effective recruiting perk, Barker found. And if the research is to be believed, the pros of a dog-friendly office could be worth making accommodations for our four-legged friends.